The HP LaserJet Pro P1102w is a basic monochrome laser printer that is especially designed for use in a home or in a small office. The device supports both wired and wireless technology. This low priced laser printer breaks the stereotype by producing printouts at a high speed as compared to other HP printers available in the market with the same purchase price. Unfortunately, higher HP LaserJet Pro P1102w toner cartridges will quickly overtake its low purchase price and also making it appropriate only for low volume printing jobs. The HP LaserJet Pro P1102w printer weighs approx. 11.68 lbs measuring 13.74" x 9.38" x 7.7" respectively. The printer has an input tray and an output tray that folds out only when needed. The device also has a 10 sheet manual-feed slot at top of the input tray for envelopes and other print media. The input tray folds down from the front panel capable of storing 150 sheets of blanks and the output tray folds out from the top panel which can store up to 125 sheets of paper. The control panel includes two buttons for wireless and job cancel along with three LED indicators for wireless connection, errors and power function. It has printing speed up to 19 ppm with resolution up to 600 x 600 x 2 dpi. The device features HP FastRes 600 print technology which uses a series of menus to create crisp looking letters, documents, postcards and envelopes. The printer is compatible with Mac OS X, Windows XP, Windows Vista or Linux operating systems. Lacks scan, copy and fax functions. The HP LaserJet Pro P1102w printer provides clean, clear and crisp results using HP FastRes print technology at high speed that the other average low-end laser printers. It supports wired and wireless technology, making it simple to save energy and space. The device has limited paper handling capacity as compared to other competitors present in the market. This could result in a big obstacle in large business, who handles large print jobs and produces large volume printouts. In addition to this, the printer features an easy front-loader system that allows users to load and unload HP LaserJet Pro P1102w toner cartridges efficiently. However, expensive cartridges results in high cost per page. How to fix a paper jam in an HP Laserjet Pro P1102W printer? To solve the repeated paper jams, ensure that the input tray is not overfilled. Use only HP recommended paper types and sizes. Do not add paper into the input tray while the printer is printing. Also, make sure you do not let paper stack up in the output bin. If the printer claims there is still a paper jam after going through the solutions above, your printer might have a hardware problem that is causing the issues. In this case, we would recommend you to contact the HP support. Q. Will I get good quality printouts if I install HP Laserjet Pro P1102W toner cartridges in my HP Laserjet Pro P1108W printer? I’m aware that my printer and these P1102W toner cartridges are compatible even though they are different models but I’d like to be sure that they yield good results. Please help. A. Yes, you can be sure of getting best quality output and performance with HP Laserjet Pro P1102W toner cartridges in your printer. Since the manufacturing company has officially declared them compatible, you can place your trust in it wholly. Q. How much savings can I make if I buy compatible HP Laserjet Pro P1102W toner cartridges from you guys? A. Well, we can assure you of upto almost 50 to 60% savings easily if you purchase these HP toner cartridges from us. Q. Does using your HP Laserjet Pro P1102W toner cartridges void my printer warranty? A. Not at all. Compatibles cartridges are in every way as good as the originals in every area- quality, reliability and even cost-effectiveness. Just make sure that you don’t accept any terms or policies that tend to pop up on your screen as they trick you into selecting compatibility with the original brands quality. If you can steer clear of it, using compatibles will be a breeze and a winsome deal for you. Q. I read that HP Laserjet Pro P1102W toner cartridges you provide come with ‘longer time duration’. How exactly would it be helpful to me? A. Cartridges that come with long time duration relieve you of worrying about replacing them soon. You won’t be compelled to use them faster than you want in order to utilise them fully as they are long-lasting and can stay functional for a longer duration. Q. What is the total sheet capacity and maximum memory for HP Laserjet Pro P1102W printer? A. The input tray folds down from the front panel and is capable of storing 150 sheets of blanks and the output tray folds out from the top panel which can store up to 125 sheets of paper. The maximum memory requirement for this printer is 8MB. Q. Is the printer compatible with different operating systems? A. Yes, the printer is compatible with different operating systems like Microsoft Windows, Windows Vista, Windows XP, Mac and Linux. Q. Why should I purchase HP Laserjet Pro P1102W toner cartridges from Printerinkcartridges.ie , for my printer? A. You can save upto 57% if you purchase HP Laserjet Pro P1102W toner cartridges from this site. We provide you with the high capacity cartridges as compared to the original ones and we also promise you the quality assurance. The compatible cartridges at our site are filled with high-quality ink, sealed and sold at a lower cost than the original ones. Besides high print quality, the compatible cartridge also comes with longer time duration and in case of any fault, you are allowed to replace your order. Q. Is the remanufactured HP CE285A laser toner compatible with other HP Laserjet printer models? A. Yes, this laser toner is compatible with HP LaserJet Pro, Pro P1102, P1102w, M1132mfp, M1212nf, M1217nfw, P1100, M1218nfs Mfp, M1219nf Mfp and many other HP printers. Q. For my small office work, I’m planning to buy HP Laserjet Pro P1102W printer. Is this printer a good choice for my work? A. If you are looking for a printer that meets the basic requirements of your small office work, HP Laserjet Pro P1102W printer would be a good choice. Though the printer lacks in scan, copy and fax functions, it is easy to install, lightweight, comes with high-quality HP Laserjet Pro P1102W toner cartridges, has good printing speed and is compatible with other operating systems. Q. I recently got an error message of low toner on my screen. I need to replace the old HP Laserjet Pro P1102W toner cartridges. How can i do this? Open the cartridge access door, and then remove the old toner cartridges. Take out the new toner cartridges from the packaging. Place the used ones in the separate bag or box for recycling. Grasp both sides of the toner cartridge and gently rock the toner cartridge to distribute the toner evenly. Bend the tab on the left side of the cartridge until it loses its break, and then pull the tab until the tape has been removed. Place the tab and tape in the toner cartridge box to return it for recycling. Insert the HP Laserjet Pro P1102W toner cartridge in the printer, and close the cartridge access door. Q. From where can i buy the cartridges for my HP Laserjet Pro P1102W printer? A. We at printerinkcartridges.ie supply both original as well as compatible range of cartridges with best quality and customer satisfaction guarantee. One can completely rely on our products as we supply the best in much affordable prices. You can also visit the site and can check the cartridge compatibility with your printer before purchasing them. Perform suitable action to order for the new supplies or to check the HP Laserjet Pro P1102W toner cartridge compatibility with the printer. Q. Do you deliver the cartridge packages outside ireland? A. Unfortunately, this cannot be possible as till now we deliver only to addresses within the Rep.Ireland & Northern Ireland. Q. I am facing a paper jam issue in my HP Laserjet Pro P1102W printer because the cartridge door was open. How do I close it? A. Unfortunately, we would not be able to advise you on this, as it is a technical printer hardware issue and we don’t stock printers. You should visit the HP customer support here: http://support.hp.com/ie-en/, even if you do not find any solution on this page you can directly contact HP support and they should be able to help further. Q. How much is a refill for HP Laserjet Pro P1102W? A. We currently do not stock refillable packages for the cartridges. Also, we would not recommend you to refill the cartridges by yourself as the toner powder can be hazardous to health. However, you can opt for our compatible cartridges, which are refilled professionally and are cheaper than the original HP Laserjet Pro P1102W toner cartridges. Q. Hey, I have purchased a new PC and installed all the new drivers for my HP Laserjet Pro P1102W printer into it. But, now my new driver is not recognizing my old cartridge. Will a new compatible HP Laserjet Pro P1102W toner cartridge work? Q. Can I use a different colour cartridge instead of the black colour cartridge in the HP LaserJet P1102 printer? A. The HP LaserJet P1102 is a monochrome laser printer which can recognize only black toner cartridge and can print only in black and white. You can buy any of the cartridges listed on this page as these are HP Laserjet Pro P1102W toner cartridges and will work perfectly with your HP P1102W printer. Q. What is the page yield capacities of these HP Laserjet Pro P1102W cartridges? The page yield capacity is based on printing 5% coverage on an A4 page, so if you print coverage is more than 5% on an A4 page the estimated page yield can be different. Q. Do these HP Laserjet Pro P1102W toner cartridges (HP CE285A) work with my HP Laserjet 1100 printer? Q. Could you tell me about the operating system compatibility for HP Laserjet Pro P1102W printer? Q. Does HP Laserjet Pro P1102W printer allow automatic duplex printing? A. The HP Laserjet Pro P1102W printer does not support “Automatic Duplex Printing”. 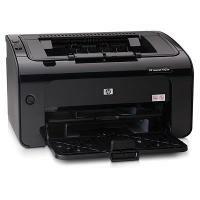 However you can manually make duplex prints with HP Laserjet Pro P1102W printer.